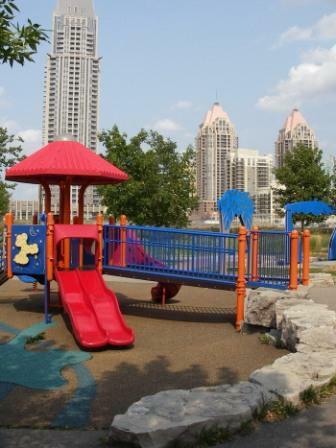 Opened in year 2001, this unique playground project was made possible through creative funding partnerships at many levels. Provincial, municipal, corporate, service club, and personal contributions were gratefully received. The budget was approximately $300,000. Our Zonta Club made a commitment to the City of Mississauga to raise $100,000 for this important venture. We accomplished that within several years. With the rapid rise in condominium housing next door to ZAP, we are looking once again to provide future enhancements to ZAP … so please consider how you, your association or your company might be part of this legacy. Charitable receipts are issued for all donations. For your convenience, donations can be made on-line through a secure site by using the button below. Those donating over $500 to the project are permanently recognized in the Circle of Friends, either through engraved paving stones or on the Founding Donor plaque. The Police Retirees of Ontario Inc. Adventure Island, sponsored by the Police Retirees of Ontario, Inc., provides numerous gross motor play opportunities (including swings), is fully wheelchair accessible, and is surrounded by rubberized play surfacing, looking like a beach with a few waves washing ashore! Sound Island features hanging & hammer chime panels each measuring approximately 3m wide x 2.5m high; turn the nose on 'talking Bobs' to record then play back your own voice in an altered state; twist the vertical poles to create interesting sounds too. Most of the equipment in this area has been custom manufactured for this playground. Touch Island is the place to explore the mosaic wall, Braille play panels, move a marble through a maze, feel the surface below your feet, play at the flower-shaped elevated sand & water tables, use the diggers in the sand pit, and pump water to flow along the trough! Maybe even make some mud! Imagination Island has a wonderful stage … just the right place to do impromptu performances for admiring audiences! Scent Island is planted with lots of wonderful 'smelly stuff' to explore with your nose and you don't even need to bend down! Sniff the centre of the big bold 'flowers' and figure out that scent; enjoy the huge butterfly sculptures. Sight Island is the place to try out the 'human sundial'; admire the patterns of light and shadow cast by the arbours & vines on the textured pathway; enjoy the wood sculptures and trees. Look for some birdhouses too! Mother Nature's Island is a naturalized area, planted with native plant species, which will mature into an interesting home for lots of critters! Circle of Friends is in the centre of it all, a place to sit and count your blessings, watch the fun, and recognize the many donors who have helped bring our vision to life.